John S. Bohannon: Preaching and The Emerging Church, 2010, 367 S.
Much has been written about the emerging church, but little thought has been given to the preaching of this movement. 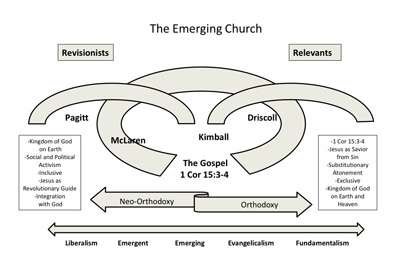 John Bohannon offers us a thorough taxonomy of the homiletics of the emerging church, showing how the movement’s leaders measure up as expositors. In so doing, he offers each of us the opportunity to take the pulse of our own preaching. If the health of the church depends upon the quality of its preaching, we will want to pay attention to this critique. Das Buch kann in der PDF Version hier gratis herunter geladen werden: preaching-and-the-emerging-ebook.pdf. Anmerkung: Die Abbildung ist dem Buch entnommen.